Pisa is a city in central Italy and is also the provincial capital. The city has a population of more than 88,332 people. The landscape of the city is much revered due to the presence of more than twenty historical churches. 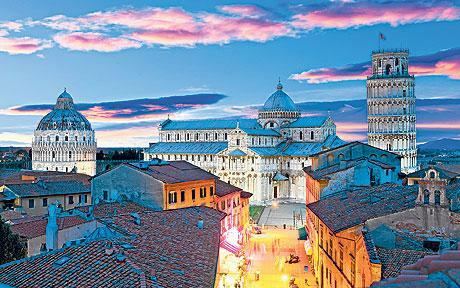 Pisa has a rich history that dates back to the twelfth century. It is also one of the most visited cities of Italy and attracts thousands of tourists annually. The tower of Pisa attracts thousands of tourists to Italy due to its inclination to one side. This site is situated very next to the cathedral. According to the records this building is the third oldest in the area. The reason for the inclination or tilt of the tower can be traced to weak construction foundation. The condition was further worsened due to the softness of the ground. The inclination became visible even before the construction of the tower was completed. The height of the tower measures up to 55.86 m on the normal side and 56.70 m on the tilted side. To climb the tower one will be required to climb more than two hundred and fifty steps. Sometimes referred to the site as the “Square of Miracles”, a term which has since then gotten popular with all. The square is full of tourists and locals around the sunset when the sun seems to cast a spell of colors over its marble walls and lush garden that looks absolutely serene in this light. Camposanto Vecchio or the old cemetery. This cemetery was constructed in the year 1278 and was later use as a burial place for the upper class residents of the area. The site according to the legend is built around the area where holy dirt was brought to during the crusades. However the cemetery was damaged during the World War II when it was under the control of the Nazis and was attacked by American warplanes. The war damage was restored later and remains a popular tourist spot for those who come from all over the world to Pisa in Italy. Getting to Pisa isn't straight forward with visitors to Italy often choosingto fly to larger airports. However those who do fly direct will be able to collect their rental cars from Pisa Airport and begin to explore the region much quicker than thos arriving elsewhere. Nice sharing friend! Pisa is a city in Tuscany, central Italy. Your blog is full of information. This city has covered a lot of attractions for visiting. My uncle visited in this city before niagara falls tour with his family. After come back he told me the leaning Tower of Pisa, Piazza dei Miracoli, San Piero a Grado and San Nicola are the most visiting places in this city. Your blog is also very useful for me on my next tour. I must go in this city on next month. Thanks for this great sharing. When you take some time to review the tourist info that is available you will undoubtedly be home able to get more from your trip overall than if you don't have a good plan.